Occupying an area of 28,387 sq. km, Barmer is among the larger districts in Rajasthan. Being in the western part of the state, it includes a part of the Thar Desert. Jaisalmer is to the north of this district while Jalore is in its south. Pali and Jodhpur form its eastern border and it shares a border with Pakistan in the west. Partially being a desert, this district has a large variation in temperature. The temperature in summer can rise up to 51 °C and falls to 0 °C in winter. Luni is the longest river in Barmer district. After travelling a length of almost 500 km, it passes through Jalore and merges in the marshy land of Runn of Kutch. In 12th century this region was known as Mallani. It’s present name was give by its founder Bahada Rao, popularly known as Bar Rao, Parmar Ruler (Juna Barmer). He build a small town which is presently known as “Juna” which is 25 kms from present city of Barmer. After Parmer’s, Rawat Luka -Grand Son of Rawal Mallinath, establish their kingdom in Juna Barmer with help of his brother Rawal Mandalak. They defeated Parmers of Juna & made it their capital. Thereafter, his descendant, Rawat Bhima, who was a great warrior, established the present city of Barmer in 1552 AD and shifted his capital to Barmer from Juna. He build a small fort on top of the city which is also known as Barmer Garh. Hill of Barmer fort is 1383 feet but Rawat Bhima build fort at height of 676 feet which is safer place than top of hill. The estate of Barmer was hereditary bhumia Jagir (independent principality), being an alloidal vassal state of Marwar (Jodhpur) in Rajputana Agency and as against the other Nobles, Jagirdars and Chiefs of Jodhpur State who hold land on condition of regular services being rendered, the Rawat owes nominal allegiance and offers service only during emergencies. Once a camel trade route, This area is rich in craft that include wood carving, pottery, embroidery work and ajrak prints. Several festivals are held in Barmer, Most important being the Mallinath Cattle festival which is held at Tilwara village in remembrance of Rawal Mallinath who was founder of Mallani Pargana. Engage in the many activities, tours and adventures that await you in Barmer. There’s always something to do in Rajasthan. 35 km from Barmer, in a town located near the Thar Desert, are 5 temples known as the Kiradu Temples. Known for their Solanki style of architecture, these temples have remarkable and magnificent sculptures. These temples are dedicated to lord Shiva and of the five temples, Someshvara temple is the most remarkable. Rawat Bhima build a Barmer fort in 1552 AD at hillock in present city of Barmer when he shifted old Barmer (Presently JUNA village in Barmer Dist) to present city. He build a fort on top of the city which is also known as Barmer Garh. Hill of Barmer fort is 1383 feet but Rawat Bhima build fort at height of 676 feet which is safer place than top of hill. Main entrance of Fort (Prole) is on North direction, Safety Burg are made on east & west direction. Boundary wall of fort was ordinary due to natural wall protection of hill. This fort is surrounded by temple on all sides. This Hill of Barmer Fort has two important religious places; Top of the hill is temple of JOGMAYA devi (Garh Mandir) which is situated at height of 1383 & at Height of 500 feet there is Nagnechi Mata temple, Both temples are very famous and have fair during Navratra festivals. Rest area is residence of former royal family of Barmer. Built in the 3rd century, this temple has been renovated multiple times. Alamshah invaded and looted this temple in the 13th century and failed to steal the idol as it was hidden in a village a few miles away. The idol was brought back and the temple renovated in the 15th century. This temple was built in the 12th or 13th century. Located in Devka, a small hamlet situated about 62 Km from Barmer along the Barmer-Jaisalmer Road, the temple is known for its incredible architecture. The village also holds the ruins of two other temples that house stone sculptures of Lord Ganesha. Located in Khed, the Vishnu temple is one of the most important tourist locations in Barmer. Even though the temple is falling apart, it is still a marvel of architecture and has a grand aura surrounding it. The markets around this temple are known shopping destinations throughout Barmer. Rani Bhatiyani Temple is located in Jasol. She is especially worshipped by the Manganiar bard community as she is said to have given a divine vision to a Manganiar. Many also refer to this goddess as Majisa or mother and sing songs in her honour. Legend says that the goddess was a Rajput princess called Swarup before she became a goddess. Juna is old Barmer it was main city build by Bar Rao but during Rawat Bhima rule they shifted Barmer to new place where present city stands and Juna remains as ruins of past glory and old heritage. It is 25 Kms from Barmer and is known for its Jain temple and old fort. According to inscriptions on a stone pillar near the temple, it was built in the 12th or 13th century. Juna is surrounded by hills and also a small lake. This temple is known for magnificent sculptures and spectacular ornamental paintings. The interior part of the temple also features rich inlay work made with glass. The temple was constructed by Shri Nemaji Jivaji Bohra in the 16th century and lies on top of a hillock in the western part of Barmer city. The Mahabar Sand Dunes remain to be one of the lesser known tourist spots in Barmer. The expanse of the Barmer Sand Dunes are equally beautiful as Sam Sand Dunes and will spellbind you for sure. To reach the Mahabar Sand Dunes, one would need to take the Barmer-Ahmedabad highway. The road is motorable and one doesn’t have to face too much trouble to reach Mahabar Sand Dunes. The sand dunes provide a perfect respite from the city, as they are quiet and less crowded and yet to be explored as compared to other spots. Visit Mahabar Sand Dunes to enjoy spectacular views of the sunrise and sunset and for an unforgettable experience. Located on the way to the Mahabar Sand Dunes, Safed Akhara, also known as the Sideshwara Mahadev Temple, is a temple complex with a garden. The temple complex houses shrines that are dedicated to Lord Shiva, Krishna and Radha, and Lord Hanuman, among others. The temple gardens are large and one can find peacocks in their full glory and beauty roaming around. The temple complex offers visitors temporary accommodation as well. The Safed Akhara is another one of the tourist spots that are often overlooked by the visitors. Visit the Akhara to enjoy the serene surroundings of its garden, away from the hustle and bustle of the city. Handicrafts of Barmer can be found in any of the renowned shop in Barmer that offers the best of Indian rural craftsmanship. One can find traditional and ethnic products, such as embroidered items, hand knitted woollen carpets, wood carvings, traditionally dyed fabrics, paintings and tie – dye beautiful products. Handicrafts of Barmer has today become a reason of prominent tourist attraction, with a wide range of quality traditional items that Barmer has to offer. If you are looking for traditional handicrafts, Vijay Laxmi Handicrafts can be one of the shop you can visit. 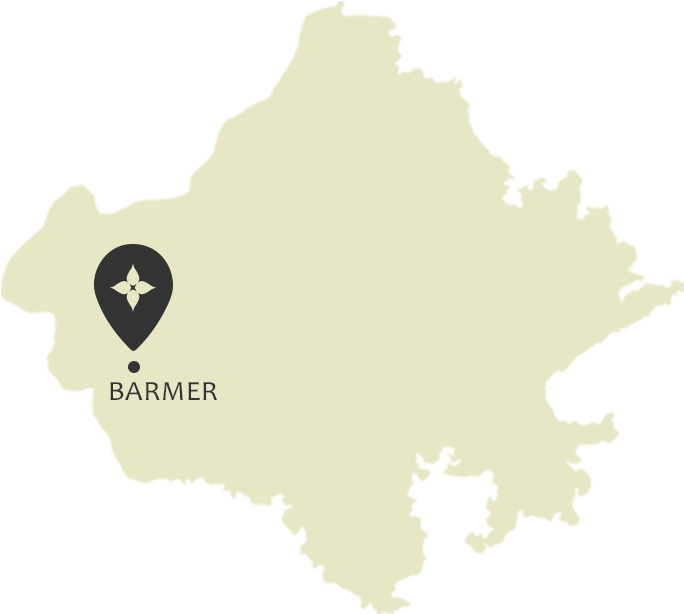 Be a part of the festivities and traditions that Barmer has to offer. It’s always a celebration in Rajasthan. Mallinath cattle fair takes place every year. The fair takes place in Tilwara, an area also known for archaeological discoveries, and goes on for two weeks. This fair is one of the biggest cattle fair of India. You can enjoy a nice camel-back ride in the Barmer desert once you are through the sightseeing. You can also attend Mallinath cattle fair that takes place every year. The fair takes place in Tilwara, an area also known for archaeological discoveries, and goes on for two weeks. This fair is one of the biggest cattle fair of India. Barmer is also a great destination for shopping if you are interested in handicrafts such as wood carvings, pottery and intricate embroidery. Carpets, rugs, shawls and other items can also be bought here. The area is also known for hand block painted textiles and carved wood furniture. The nearest airport is at Jodhpur around 220 km from Barmer. State-run buses connect the town with most of the cities in the state including Jodhpur, Jaipur, Udaipur. The Barmer railway station is well connected to Jodhpur, which in turn is well-connected to other major cities of India.